A Place at the Beach II is the perfect rental for a family that wants a great location and fantastic value. Enjoy the Ocean Drive Difference by starting your vacation immediately upon arrival, as this property comes with fresh bed linens/bath towels, the beds are already made up for you, and the departure maid service are all included in your price. 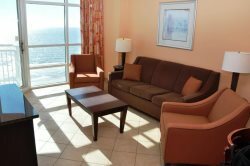 This unit is a 2 bedroom, 2 bath condo that sits directly across the street from the beach and features a full kitchen, private balcony with patio furniture, a living room, flat screen TVs with cable and DVD players, and close proximity to convenience stores, restaurants, and grocery stores. The master bedroom has a king bed and the guest room will sleep 5 people in its bunk beds. The flooring was replaced with attractive laminate. Enjoy the inlet views off the balcony, and walk to several great fishing spots either on the beach, off the pier, or in the Cherry Grove channels. This condo is minutes away from the best things to do in the North Myrtle Beach area. Live entertainment, outlet shopping, golf, and attractions are all within a 30 minute drive. Fun activities like deep sea fishing, miniature golf, and parasailing are even closer. Book your vacation now and start looking forward to your trip!